PARIS (AP) — Algeria's deadly expulsions of migrants into the Sahara Desert have nearly ground to a halt after widespread condemnation and the abrupt firing of two top security officials. 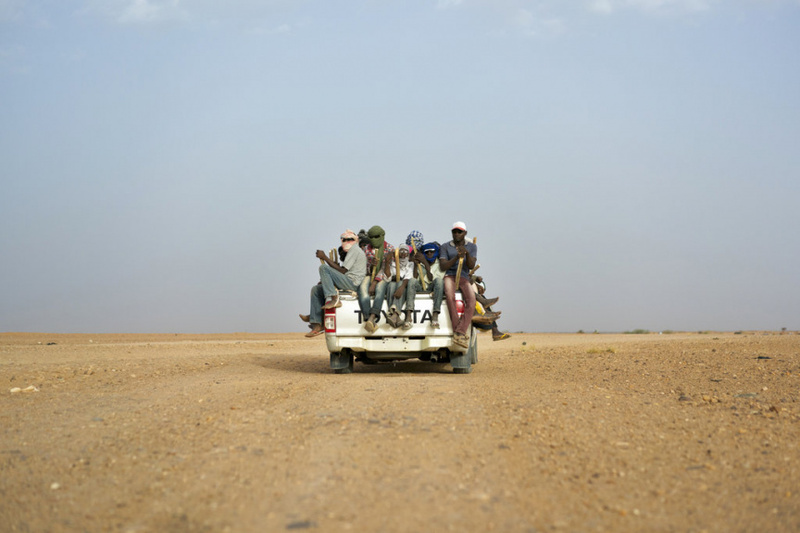 The expulsions to the desert borders that Algeria shares with Niger and Mali have all but ended since The Associated Press reported less than three weeks ago that more than 13,000 people, including women and children, had been dropped off in the stark, dangerous region since May 2017, according to officials with the U.N.'s International Organization for Migration. Before the AP reached out to Algeria for comment and published the report on June 26, the North African nation was expelling migrants by the hundreds almost every week into the unforgiving desert, sometimes to their deaths. Algeria has refused repeated AP requests for comment on the expulsions. The European Union also declined to comment. The expulsions came as Europe is pressuring North African governments to head off the migrants before they can cross the Mediterranean Sea. An aid worker with contacts in Algeria told the AP that the mass detentions continue, but now migrants, including dozens of pregnant women, are warehoused in overcrowded jails. The worker requested anonymity to avoid retribution from the Algerian government. Algeria also continues to deport migrants from neighboring Niger, with which it has had an expulsion agreement since 2015. But while migrants from other sub-Saharan countries were dropped in the desert secretly and forced to walk for miles under the blistering sun, the Nigeriens have long been driven to the border by convoys. After the AP report in June, Algerian officials invited local media to watch such a round of deportations to prove they were humanely done. Since the AP report, Algeria's security forces have fallen into disarray, with the head of the gendarmerie and the chief of national security both being forced from their jobs. It is unclear why the men were fired, but both were linked to the migrant expulsions in the desert as well as to an unrelated corruption scandal involving the seizure of more than 700 kilograms (1,550 pounds) of cocaine from a cargo ship in May. In its few public statements, Algeria has insisted that migrants are treated appropriately, but the U.N. High Commissioner for Human Rights has condemned the expulsions in the desert. Two days after the AP report, Human Rights Watch also released an investigation into the forced desert marches. "Algeria has the power to control its borders, but that doesn't mean it can round up people based on the color of their skin and dump them in the desert, regardless of their legal status and without a shred of due process," Sarah Leah Whitson of Human Rights Watch said in a statement. Migrants filmed videos of themselves fanning out across the open desert, stumbling through heat that reaches above 50 degrees Centigrade (122 degrees Fahrenheit) in summer as Algerian gendarmes with guns ensured they did not turn back. Of the more than two dozen migrants who AP journalists interviewed in Niger, nearly all reported seeing deaths during the forced march, which sometimes lasted days. Even before the AP report, the conditions that migrants were enduring in the Sahara Desert had been an open secret among aid workers as well as governments in Africa and Europe. The African Union had already complained about Algeria's policies toward migrants in a statement in May. "We cannot accept African countries ill-treating Africans, even if they enter the country illegally," the chairman of the AU Commission, Moussa Faki Mahamat, said this week in Addis Ababa, Ethiopia. European Union officials say they discussed the desert expulsions with Algerian government officials privately in recent months, but the EU nonetheless settled upon Algeria as one of a handful of countries where it had hoped to set up centers to sort economic migrants from asylum-seekers fleeing for their lives. Algeria refused the dubious honor, as did multiple other countries. Elias Meseret in Addis Ababa, Ethiopia, contributed.